This game will be a hard one to predict, but that won’t stop us from trying. The big question this week is whether Ben Roethlisberger will return under center for Pittsburgh after injuring his knee in Miami in week 6 and missing the game against the Patriots in week 7. There have been rumors about the probability of Big Ben playing in Sunday’s game against the Baltimore Ravens, but as of right now nothing has been decided. If Roethlisberger is out, then that means that the Steelers will go with Landry Jones and that won’t be good news for Pittsburgh. However, it will be a whole different game is Ben is on the field, or will it? Let’s consider history, Ben Roethlisberger hasn’t won at Baltimore since 2010, not only has he not been able to win, he has lost every game by an average of 13 points…ouch! In his last four appearances at M&T Bank Stadium, he has only been able to complete 61.5 percent of this passes for an average of 243.5 yards per game and 6.2 yards per attempt. These are not good stats for a quarterback as experienced and good as Big Ben. When you consider that, and stack it up to the Baltimore Ravens being ranked 6th in yards per play allowed this season and the fact that they have a fairly good defense, then things take a bleak turn for Steeler fans. So regardless of whether Ben Roethlisberger is the starting quarterback in this game or not, things won’t be easy for the Pittsburgh Steelers. Having said that, the other side of this story doesn’t look very encouraging either, Joe Flacco and Co. have lost four games in a row, and the wins that they have under their belts were against bad teams, and they barely won some of those which cast a dark shadow on their probabilities of reaching the postseason. Joe Flacco and the rest of the offense, especially the receivers, are in constant uphill battle to try and get some points up on the scoreboard. Now, the Steelers defense is nothing to write home about this year, but they have moments of sheer brilliance, their problem is consistency. 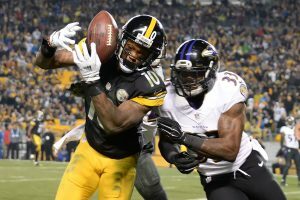 However, this defensive lineup knows how important it is for them to show up especially when Ben Roethlisberger is absent, so Flacco can expect to have a difficult Sunday. I know we have all ragged-on Landry Jones, but the truth of the matter is he had a decent outing against the Patriots in week 7, which is saying a lot. If he starts on Sunday, he will have all the offensive weapons at this disposal and I expect Antonio Brown will be his main target in the game. Baltimore is almost always good on defense and I am curious to see what they will do to slow down Le’Veon Bell. Early NFL lines at www.AceSportsbook.com opened with Baltimore as a 2.5 home favorite, this line quickly moved to 3, but after rumors started circulating about the possibility of Roethlisberger starting on Sunday the line has been off the board until further notice. Baltimore should win this one, but I doubt they will cover the spread.